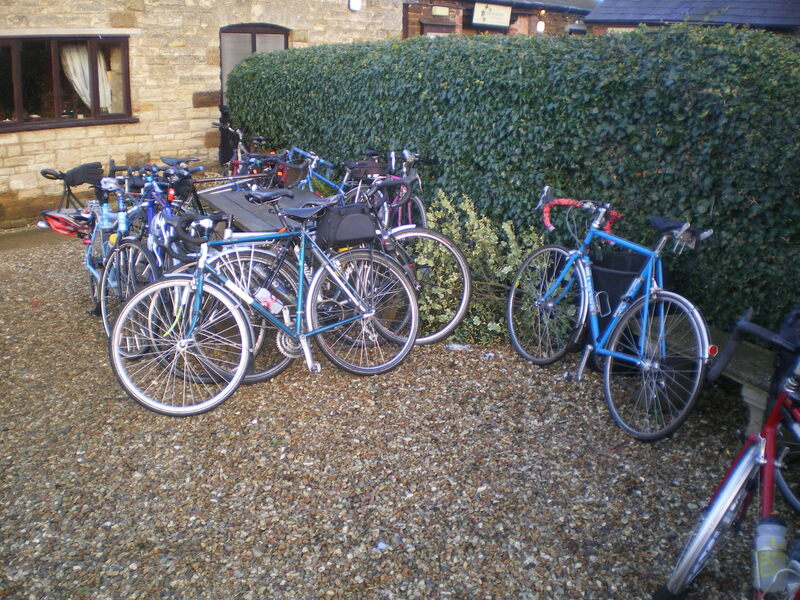 We shall start at the Canoe Centre (Nene Whitewater Centre, Bedford Road, NN4 7AA) at 9.30 a.m.
It’s a challenging ride – short but fast for the morning. We’ll be 50/50 on/off-road, using some of the lesser-known trails which connect Northampton’s parks and woods. The surfaces are reasonable so either an MTB or a sturdy touring bike would be fine – but not your best road bike! Coffee stop at Salcey Forest Café. An overcast start to the morning meant that we would, at least, be riding without fear of drivers being blinded by the sun. It also meant that our leader had much to do to keep us motivated. Seven of us were motivated enough to be there at the start but there had been mention of shortcuts. We departed East Hunsbury fairly briskly on the usual route out through Blisworth to Roade and from there past the pub at Ashton where the Christmas meal is being held this year. There did seem to be a fair amount of mud on the junctions round here, not that it caused us any problems, but it is that time of year so take a bit of care if you’re out that way. We made it over the rail line to Long Street in good time and nobody opted for the shortcut, so Phillip’s route must have been keeping our spirits up, besides which it wasn’t cold enough to cause problems – once you’re moving, that is. It was rather chilly whenever we stopped. We looped south through Hanslope and back up again to Stoke Goldington, passing Olney signs on the way, before escaping from the Milton Keynes district to cut across the middle of Salcey Forest and head to the café for coffee. The café was doing good trade for a winter’s morning and there were even a couple of non-cyclists in there, though they were hugely outnumbered. Between Salcey and Quinton, we passed the construction entrance for the M1 Windfarm that’s currently under development and which will boast nine smaller-than-planned turbines by the time it’s finished. At Quinton the group split. Riders from the east side of town opted to avoid the west turn to Courteenhall, as did Rowan who, with a dangling front light, was opting for the shortest route home, leaving a much reduced group to brave the A508 between two lovely stretches of country lane. That road doesn’t get any better, which is a shame because the lanes to and from it are lovely and very quiet. The stretch back through Blisworth to East Hunsbury brought us up to the 29 mile mark, according to my route planner, rounding off a very pleasant, briskish, winter’s morning ride. Thanks to Phillip for organising the route. Join CTC Northampton for a brisk(ish) ride to Salcey Forest this Saturday, 23 November 2013. The route will take us south-east through Roade and Hanslope to Gayhurst, then back north-west through Stoke Goldington to Salcey. There is the option for a teastop at Salcey Café, after which we return to the start via the pretty Courteenhall Road. The aim is to ride with as few stops as possible, at a good but sensible pace for the time of year (12-14 mph). Terrain is reasonably flat apart from Hunsbury Hill and Roade to Hanslope. Road bikes are ideal. The full distance will be 27 miles – with various optional shortcuts available. The weather forecast is cool (2 to 5 degrees C) but dry with a light northerly wind, and potentially some sunshine. Ride starts from East Hunsbury (Overslade Close, near Hunsbury Library) at 9.30 am. Despite the wintry gloom and fairly persistent drizzle, an intrepid group of seven riders set out from Moulton Co-op for Woodford Mill under the leadership of Bill. Visibility was pretty limited so we didn’t see too much of the countryside but took the opportunity to ‘catch’ up news-wise with other riders in the group. Brunch at the Mill café was very welcome especially as the proprietor waived the 11.00 a.m. limit for breakfasts and bacon sarnies and served us with unlimited coffee etc. That was also where John Weller – our Christmas meal organiser – waved the Christmas menus at us and reminded us going to choose our courses and put down a deposit of £5! You have been reminded! The ride back to Moulton seemed harder and longer to me but that’s probably because I had the full English, several rounds of toast and two large coffees – should have had a flapjack I think! A good ride and breath of fresh air – thanks Bill! 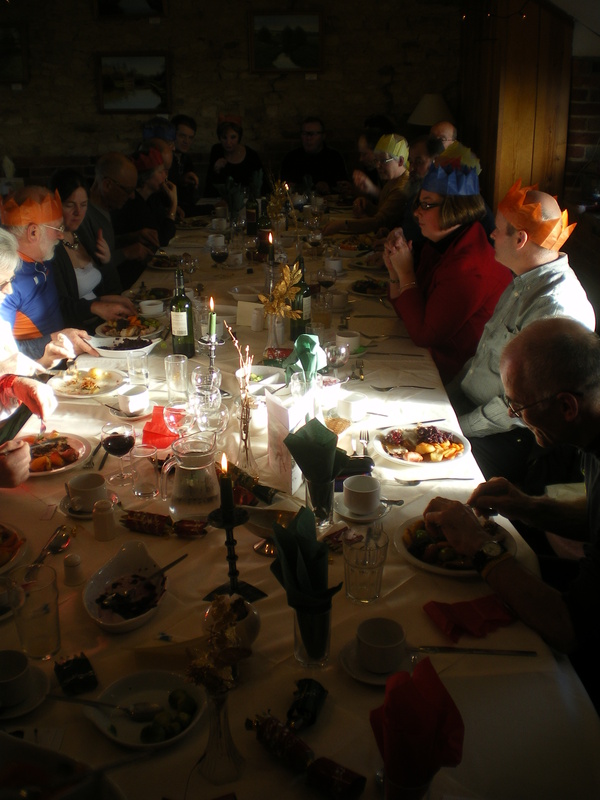 You’ll have seen from Peter’s post here all about our Christmas lunch on Sunday 15th December 2013 at the Old Crown, Ashton (near Stoke Bruerne) – including menus and booking contact. It’s a good venue! If you want to ride there in a group, Bill Simpson (07736 600858) is leading a ride starting at 10.00 a.m. from East Hunsbury (Overslade Close, NN4 7AA) with an elevenses stop in Towcester. How we got there last year! 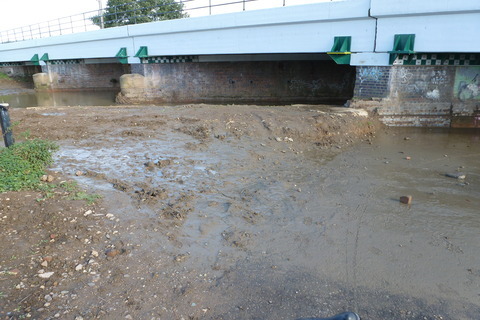 Now this is also National Cycle Network Route 6 and so an important cycle path – and one local CTC member, Peter, reports on his dissatisfaction with the upgrading nine months on. Last week I chanced my luck and tried out the Route 6 through to Kings Heath from Kingsthorpe, going under the railway and along side the Nene. 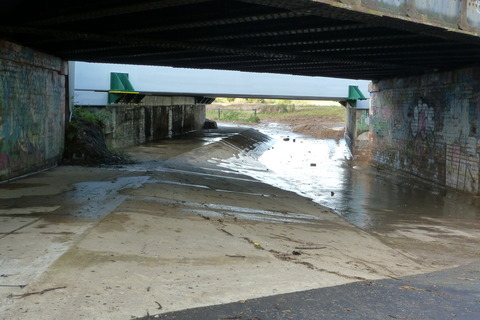 This section had been finished for some time, but access had been inhibited by the work that continued on the Kings Heath side of the bridge. Thanks to Phil’s info – we now know it’s open !! We’d had quite a bit of rain, but not a “flood”. The river had subsided into its bed and the tunnel under the railway was mostly clear of running water. I am not all together enamoured with the final result. Perhaps I’m niggling, or perhaps I’m not alone in my criticisms. 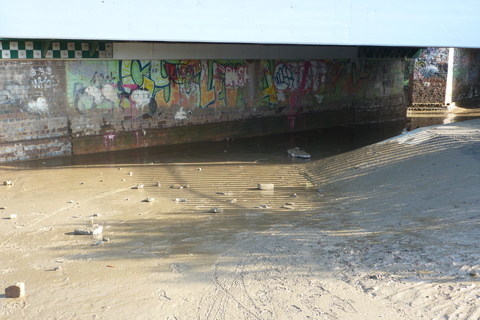 The lower section has a layer of mud and stones left by the flood river, which does not wash out with the flow of water. The upper “dry” section of path leads onto a quagmire before reaching the new tarmac path up to the green (?) lane. The slope of the land and bank must drain directly in to the river at this same point, but no account of this seems to have made in this “improvement”. To my mind there hasn’t been a great deal of joined-up thinking put into what must have been an expensive project. Surely a few minor and inexpensive amendments might be made which could make all the difference to a good job done and an inferior bodge. I’m not only a grumpy old man, I like my cycling and would like to see my taxes spent wisely!